Why should I foresee ‘RUCIP’ in my potato contracts ? RUCIP has been since 1956 the reference for national and international potato trade. It offers a chapter on rules (the contract, the potatoes, cost and risks of transport, delivery and payment, complaints and disputes) and as well the possibility of expertise as arbitration. RUCIP has been updated several times by its members (Europatat, EUPPA and Intercoop) in order to adapt to the ever changing practises in the potato trade. Once a clear reference of RUCIP has been mentioned on the contract, signed by the concerned parties, the RUCIP rules apply. Does the reference ‘RUCIP’ in my contract allow me to make specific arrangements between buyer and seller ? Yes, the RUCIP rules are subsidiary to the contract conditions. This means that specific conditions on the contract have precedence on RUCIP conditions. If the contract refers to RUCIP, but excludes certain chapters, the contract conditions are applicable. Is RUCIP applicable to all parties in the potato chain ? Yes, RUCIP can be used in all potato contracts between professionals in the potato chain (producers, trade, processors). Legal practice in court cases in several countries has been illustrating this. Is RUCIP complex for potato professionals to apply ? 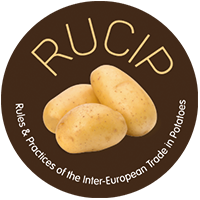 Although RUCIP is based on potato trade practises and the rules have been updated several times (especially the revision of 2012 has resulted in a more practical document), it is important to know the rules in order to be aware of the obligations and benefits. Following training on RUCIP, which is regularly organised by national RUCIP committees, and having the rules always available is important. Especially the chapter on timing and procedure of complaints needs some extra attention. Do I need to be a lawyer to understand RUCIP ? Definitely not ! The RUCIP rules have been drafted by potato traders and are written in an understandable language. Though the rules are officially written in French, translations in English, German, Czech, Dutch, Italian and Spanish have been made available and are available on the internet. Members of trade associations can contact their organisation for assistance and advice to work under RUCIP rules. Although the RUCIP rules clearly prescribe what to do in case of an arbitration, legal support can be useful at that time. The secretariat of your trade association can help you to find experienced legal advice in RUCIP. How can I ask a RUCIP expertise and what does it cost me ? In case of a complaint and/or dispute on the quality of a delivery RUCIP provides you the tool of a professional expertise by a trained and approved expert. It is important that RUCIP is clearly part of the contract, if not a RUCIP expertise can only be asked for on specific conditions. As is written in article 1 of the expertise rules an expertise can be asked for as well by the seller as the buyer at the national RUCIP secretariat in the country where the goods are available. It is crucial that timing and traceability of the goods are kept in mind. The written demand to the national (if available) or European RUCIP secretariat has to prove the reference of RUCIP in the contract and stipulate the location and state of the concerned goods. Finally the demand also includes the specific issues on which the expertise has to focus. The competent RUCIP secretariat will appoint an expert and inform all concerned parties about the timing, location and procedure of the expertise. Important to notice is the fact that – contrary to the arbitration procedure – parties cannot choose the expert ! The demanding party will have to pay the estimated cost in advance to the RUCIP secretariat. The outcome of the expertise will indicate how the final account has to be settled by both parties. The cost of the expertise (cost for the organising RUCIP secretariat and the expert) can be found on the RUCIP website. For a normal (national) expertise an amount of € 500 has to be considered as normal, however this will depend on travel costs and supplementary costs as laboratory testing. The export will – if possible – orally inform all concerned parties on his conclusions and the RUCIP secretariat will forward a copy of the final report to all concerned parties, including an invoice to the demanding party on the costs. If necessary an extra advance will have to be paid before the report will be send out. If one of the concerned parties doesn’t agree, a counter expertise can be asked for. What is the difference between an expertise and an arbitration ? The expertise is an instrument provided by RUCIP to assure a quick and professional status of the goods (more or less ‘a picture’) in order to create a basis for a commercial solution for a discussion between parties. An arbitration is a legal procedure to solve a dispute between parties, which offers the advantage of a decision being rendered much quicker than through court proceedings, and at the same time, the parties have the certainty that a decision shall actually be rendered (even if they finally do not find a solution agreeable to all of them). There are considerable similarities between arbitration and court proceedings, except that the person deciding the matter is not a judge appointed by the government. Depending on the nature of the case, it is sometimes possible to opt for arbitration proceedings without assistance (and without the cost) of legal counsel, or with the assistance of technical advisors only. Can I choose between a court proceeding or an arbitration in case of a RUCIP-contract ? No ! As is written in Article 1 of the RUCIP rules the reference of RUCIP in potato contracts results in the fact that parties can only make appeal on arbitration. In case of a public court case concerned parties can ask the judge to refuse to treat the case and to refer to RUCIP arbitration in his judgement. The only reason to go to court in case of RUCIP contract is when a party believes the general precepts of the law have not been followed in the procedure or the judgment. How to start an arbitration and what will it cost me ? The RUCIP-arbitration is in some cases the ultimate instrument to solve a dispute between potato professionals. In that case the RUCIP arbitration rules apply. The concerned party can send his request for arbitration to the National RUCIP secretariat of the country of the other party. If there is no National RUCIP secretariat available the demand has to be sent to the European RUCIP secretariat. This request has to contain the names, profession and addresses of the parties, a description of the objectives of the litigation, a summary of the disputed facts and a precise claim (included annexes) and has to be sent in 5 copies to the competent secretariat. Depending on the demand the competent secretariat will ask for a deposit (information to be found on the website of RUCIP). Depending on the value of the dispute an arbitration commission of one (less than € 10.000) or three arbitrators will be created. In the second case both parties can appoint an arbitrator from the available list and the secretariat will choose the chairman of the commission. All arbitrators have officially to accept their nomination. However both parties can appoint their arbitrator via the RUCIP secretariat, it is not allowed to contact this person on the case ! Both parties are allowed to communicate in written (defence memorandum), in sufficient number of copies defined by the secretariat. The secretariat will decide with the arbitrators the place, date and time of the meeting of the arbitration committee and the hearing will be organised verbally. The parties should – if possible – appear in person. However a lawyer can represent them. When a party is not present the arbitration commission can proceed and pass award. The arbitration commission will always try to reconcile the parties. A deliberation of the arbitration commission will lead to a judgement. Normally an award must be given and made known within a period of 9 months. However this period can be prolonged at the request of the president of the arbitration commission by the national or European delegate. Parties can go into appeal via a 2nd degree procedure at the level of the European RUCIP secretariat. A similar procedure applies.